Ever peeked over the side of someone else's boat, or seen another person out for the day and said to yourself "Now that is a Bl - - dy Good Idea!!" This page is devoted to the amateur ideas man or woman who loves their fishing and their boats. 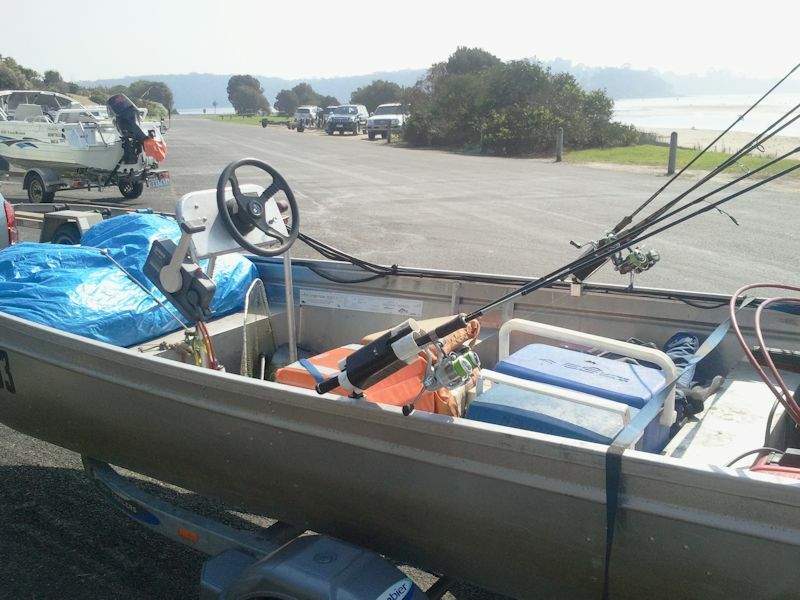 NB Any modifications or additions to boats or fishing gear or any other gear are shown here are for your own investigation and you must subsequently take full and unconditional responsibility if you decide to act on any ideas from these pages. have you made a great contribtuion to fishing that needs recognition? Email us today! 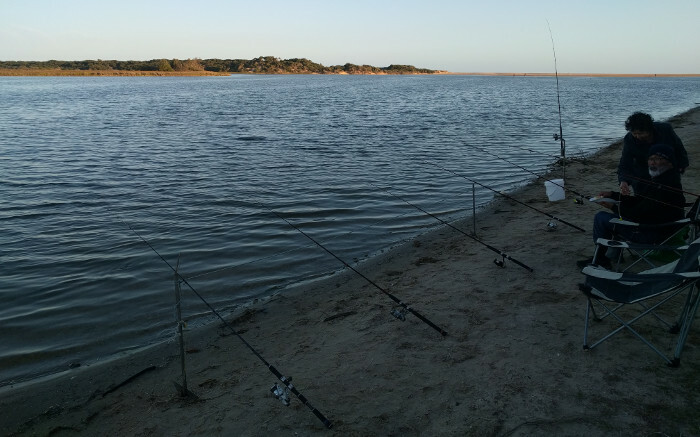 Ever gone off and found you have left most of your rod holders at home? Well with a bit of rope and a great idea you can make many rod holders like this gentleman. Ever got into trouble for storing your bait in the freezer and things have got a little on the nose!!! You maybe relying on the standard zip-lock bag to keep the smells in. They are not real good. 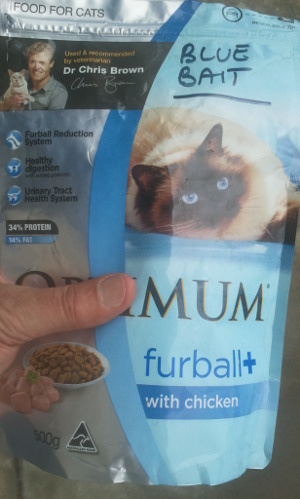 However using the heavy duty zip-lock bags that pet food, e.g. cat food comes in will seal every thing inside the bag and won't have prawn spikes producing little leaks!! Don't forget to let the other half know and label things properly or kitty might not be a bit confused!!! 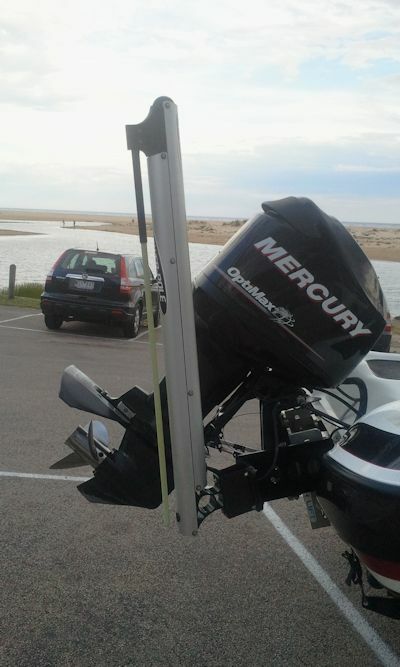 This particular boat had a very nice answer to the problem of how you get get good weight distribution in a tinnie for good cruising at near to top speed, and keep control of the boat. Front steering and motor control is the answer and this is a particularly nice example where the steering and the speed/direction controller is very well thought out. I have a 40hp Mercury on a 4.3 Millenium hull and this bloke was keeping up with me with 15hp coming back from Blackfellows Arm. Mount a pantograph at the back of the boat with a pole attached to it so that it can be "speared" into the bottom of the river or lake to hold the rear of the boat steady. I have tried a number of systems, such as poles and weights on sprung lines (to avoid wave bounce lifting the weight) However this is the best one yet, mind you, it is the most commercial and no doubt the most expensive. I think it could be effective to about 1.5metres or so? Now who would not enjoy the irony here. Instead of dreaming of fishing while in the office chair in the office, this guy is really fishing in the office chair in the boat. Excellent height adjustment if you want the view for navigation, or duck for cover if the weather turns nasty. Get the back support right for lumbar relief. Mmmm, nice one. Excellent padding and ergonomics, mind you if you could get the actual boss' chair ie with the arm rests, a stubby holder would go well. Note a fair bit of homework has been done to anchor it to the floor. This really needs to be done well and not likely to come loose next time a big wave is breasted and control of the boat is paramount!!! 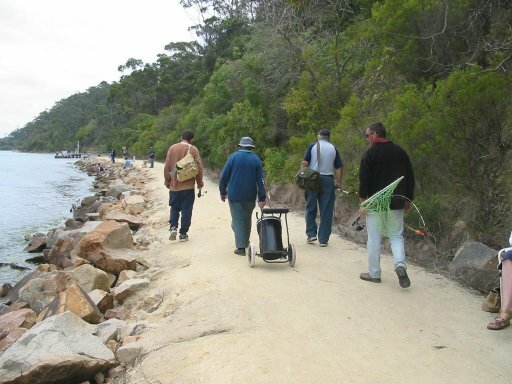 The old golf buggy, with its narrow tyres and out of date frame can be given a new purpose in life by adding the big bucket for the fishing gear and keeping the seat on the back. No need to round up all the gear, it's already in the buggy and ready to go!! Room enough to haul home the big day's catch as well. Ever wondered why you missed that bite? No bait on the hook yet again? Probably because you were not watching, and why were you not watching? Because your rod tips were way to billy'oh somewhere else, in the air, over there, way too high. Where is the most relaxing place to keep you eyes? On the horizon! So this shows how you can set up a rod rest that pitches the tips near the horizon. Change where the handle rests and fine tuning is a breeze. Get some 50mm pipe or whatever your rod holders take and make a big upside down "U". Now the finishing touch is to add some window sealing rubber (is it rubber or synthetic?) along the side where you expect the rods to mainly rest. This stuff with the sof profile grips like glue and allows rods to be quickly positioned and stay in place. If you see a bite the handle is at your feet ready to go, and you can strike without fear of tangle or dis-engaging complcated rod holders. Try it, you will like it. Just don't lean on it! Found the perfect spot? Just need a bit od comfort and convenience when you get there? 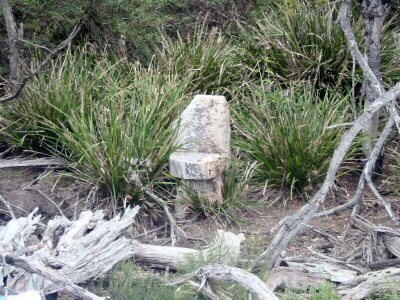 Well why not cut a seat from a stump like this enterprising person has done at Mallacoota? Quite a clever idea though don't let the lake rise over the top of it like this seat has experienced as it now has a very nice covering of very sharp Barnacle shells all over it!!! Most uncomfortable.